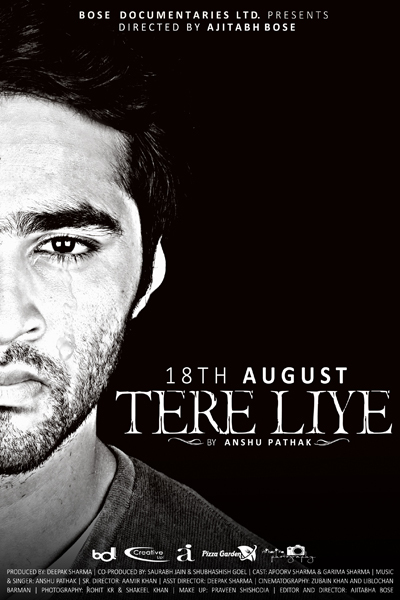 Created by Bose Documentaries Ltd., Tere Liye is a song that describes the pain lovers experience when they face deceit in love. It tells the tale of a lover who is ditched by his girlfriend and how he keeps calling her back through his lyrics. The boy remembers the happy days he spent with his partner and pleads her to return with tears constantly flowing down his face. The entire song narrates the pain of the lover as he makes emotional pleas to his girlfriend assuring her of his undying love and his devotion for her. The music of the video is really good although it could have been a bit more soulful to match the emotion and pain depicted in the video. The sound of electronic instruments can be easily discerned which enhances the quality of the video even further. What makes the music truly interesting is the beautiful manner in which the beats have been mixed to create a resonating effect. Anshu Pathak has sung this song beautifully, even though the signer has failed slightly in bringing out the actual pain depicted by the jilted lover. However, the singer has great control over his voice and signs in accordance with the tone and the beats, which has a truly mesmerizing affect on the viewers. Both the lead actors, Apoorva Sharma and Garima Sharma have performed really well. Apoorva has really done a brilliant job of playing the role of a lover who has just been left by his girlfriend and has wonderfully expressed the emotional pain and stress he is going through. On her part Garima Sharma has also played her part well, although she is mostly seen in the flashbacks of Apoorva. The video has been captured in a beautiful manner. Right from the close-ups of Apoorva face to the beautiful scenes of the two lovers spending happy moments together with picturesque backgrounds, the camera work for the entire song is truly enthralling. Apart from the first few seconds, when the image is somewhat dull and blurred, the overall video quality and light usage is perfectly professional. The editor of the video needs to be commended for a doing a perfect job. The video has been edited in a manner that makes it heartwarming without shifting away the focus from the subject of pain experienced by a jilted lover. The flashback scenes have been aptly placed between stanzas so as to provide the viewers an idea of both the happiness and pain experienced by Apoorva. The most important highlight of the video is undoubtedly the performance of Apoorva Sharma. His expressions and his acting have made this video stand apart from the hoards of other similar videos. In addition, the lyrics and music of the song are also something that will capture the hearts of the viewers and lead to the popularity of this video. Director Ajitabh Bose and his company Bose Documentaries Ltd., has done a commendable job in creating a unique video based on a popular theme. The video deserves a rating of 4 out of 5 for the beautiful way in which it has highlighted the pain of a lover who has lost his love.